Below are notes from our brief July 2018 meeting, held at Levitt Pavilion in Ruby Hill Park. Discounted non-profit priced tickets ($25/day) will be available through the Grandoozy box office prior to the event on a first-come first-served basis. It will be a will-call pick-up with proof of address requirement. Make sure you follow the neighborhood Facebook page and sign up for updates from the neighborhood association website for more details as they become available. Park Tax Proposal Question Answer – General info is to align Denver County with the rest of the state by allowing for a small addition to sales tax to be used to maintain, manage, and obtain park land through the Denver-owned properties. That would equate to $2.50 on every $100 spent and the overall increase in funding would primarily come from tourists. Will be going through second reading on Monday, July 16 and then voted on by City Council to see if it will appear on the November ballot. Boundaries N: Mississippi S: Evan Ave. E: Platte River Drive W: Federal Blvd. 50% off tickets available after initial discounted ticket distribution is exhausted. Regarding the parking – there will be some “barricades” at key streets indicating local parking only, although they are barricades that are for notice—people can drive around them if they want. We will also coordinate the community hotline with the police and right of way enforcement for towing any cars that block driveways. 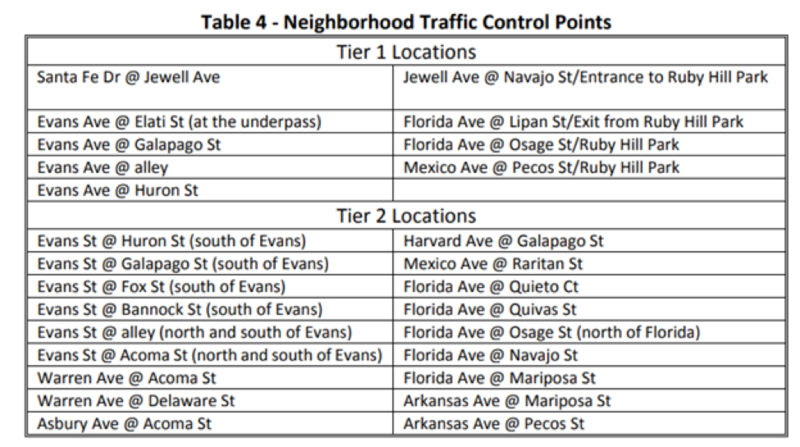 The City will manage Tier 2 areas by restricting on-street parking to residents only and following up with ticketing and enforcement. On-street parking in the industrial areas is not intended to be restricted aside from existing parking regulations. New zoning is being proposed, looking like apartments but this meeting is in the future.